Love, love this sink. I had a farmhouse sink in another home. This Kraus model has a divider splitting the sink into one large sink and one smaller. If I want to hand wash dishes it's much easier to fill the smaller sink with water. It was the only thing I didn't like about my old sink - it wasted too much water. The price is right too! Known for outstanding quality, Standart PRO sinks feature contemporary tight-radius corners and channel grooves designed for superior drainage. Undermount installation creates an uninterrupted transition from countertop to sink for a seamless look. Dimensions 32.0 In. X 19.0 In. X 10.0 In. Have been purchasing Kraus sinks for years now when remodeling. In my opinion the best kitchen sinks out there and the pricing cannot be beat when purchasing here on Overstock. Even the drain assembly is top notch. 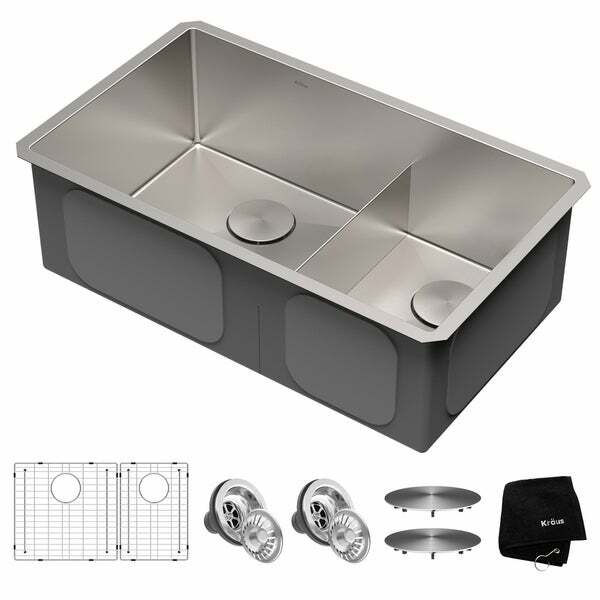 This is the second Kraus sink that we have purchased. We are we having an entire house and shopped extensively for the right kitchen sink. The quality, price , design and quick delivery Made this decision to buy. This sink is a beautiful addition to our kitchen. With the slim divider, it looks very high end. There are some great accessories that come with, and there are some additional accessories to be found on Overstock. I personally like the roll out mats that can span the opening (Kraus model KRM-10). We're having a new kitchen put in and I had wanted a sink that allows the garbage disposal to be on one side but still have the feel of a large restaurant sink. Kraus sinks are the absolute best!! High quality at a great value! This one is identical to the Koehler sink my plumbing rep suggested for me. I love it. Came out package very well, I wanted a one sink but my husband wanted a double sink so this is our compromise Lol. It is very durable clean lines and very good purchase all together. Love the clean design. Came with a towel rather than mitt and trivet as mentioned in the description. Great product, great price, great delivery! One of multiple products purchased. "Wall to wall my cabinet is 34 1/2 inches, will this sink fit in that space?" Hello, Thank you for your inquiry. Please be advised we recommend a minimum cabinet size of 36 inches for this model.